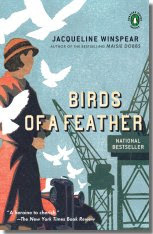 After finishing the first Maisie Dobbs novel, I was excited to read the second one to continue following her exploits. In Birds of a Feather, Maisie continues her successful detective agency along with help from her assistant Billy Beale. Maisie is called in by a powerful businessman, Joseph Waite, to discover why his daughter Charlotte is missing. He is a gruff, unpleasant man and doesn't really seem all that concerned about the fate of his daughter. He is more worried about appearances should the story get out. At the same time, Maisie's police colleague Inspector Stratton is investigating several brutal murders. Maisie investigates the crime scenes and discovers a similar item was left at each: a single white feather. Maisie is then able to link the missing girl and the current murders with events that happened during World War I, when Maisie worked as a nurse. The police, of course, are not at all convinced by Maisie's theory, but she arrives at the truth at last. Unfortunately, the story doesn't end there. Maisie, apparently buoyed by her success in the case, takes it upon herself to go all preachy, and bestow a great deal of unwanted advice on people who would not realistically take it from her. While the story was a decent enough mystery, the sudden emergence of Maisie as someone who knows how to settle problems for everyone (whether they wanted her advice or not) was a bit unnecessary. Save the preaching for a more appropriate character, Ms. Winspear!